If you're not crazy about the video tutorial (sorry that the volume wasn't great … I recorded it five times in an effort to get that part to work better), I also have the screen captures from the video. Let me just give you a little explanation on the steps I would take to find missing content. My first step is to check the location where the software wants to find your content. 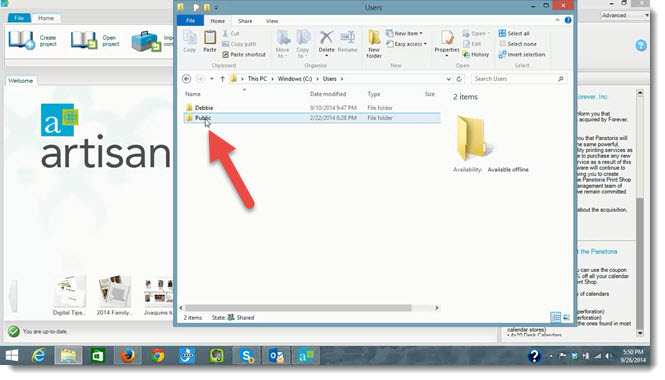 Open your file explorer (usually from the file folder icon in your taskbar) and double click your C drive. 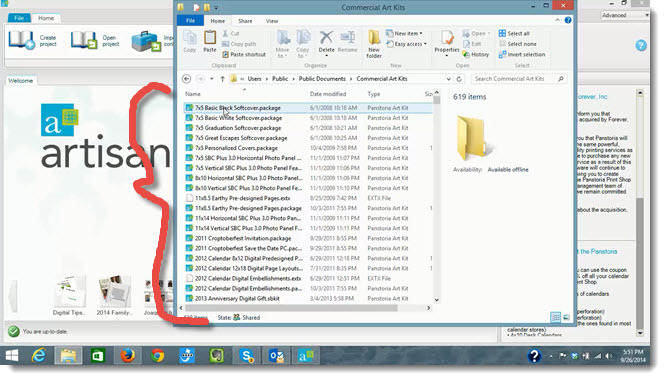 In the C drive folder, open Users. 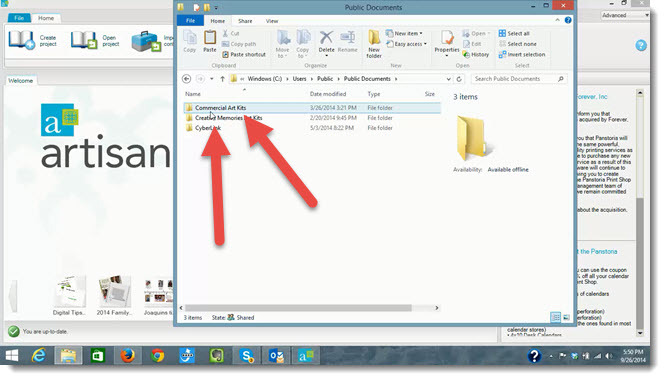 Look for the Public folder, not your personal folder. 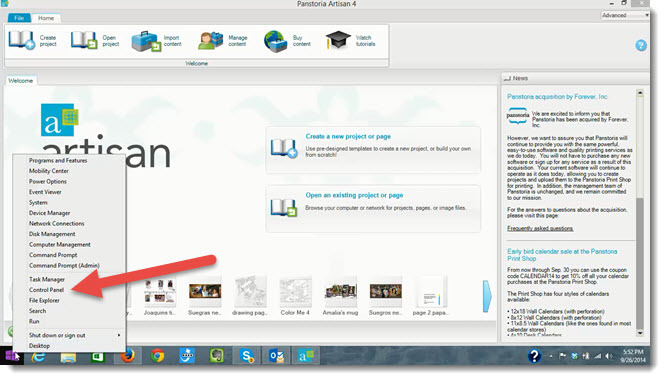 In the Public folder, look for Public Documents. This is where your software WANTS to find your content. 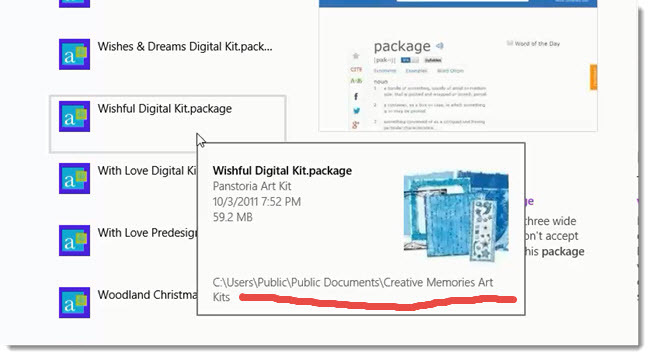 With Artisan, there will be a folder called Commercial Art Kits. If you used to have Storybook Creator, there may also be a folder called Creative Memories Art Kits. It's ok to have both. Just don't move them. If your content is not here, or you know there's a package that you had that isn't listed, here is how I would look for the content to add. Go to your Start button and access your Search function. On Windows 7, it's a Search box that pops up right above the Start button when you click on it once. 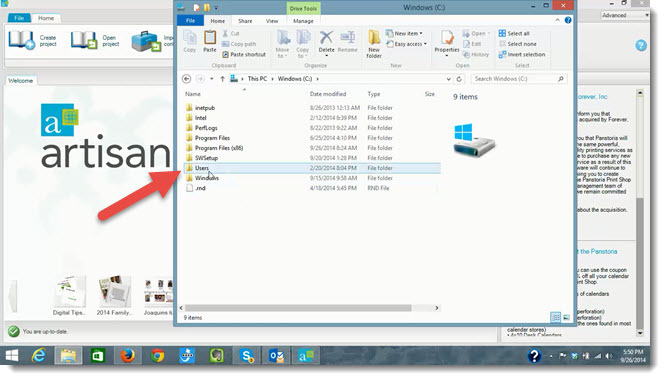 The picture below shows how to find it in Windows 8/8.1. 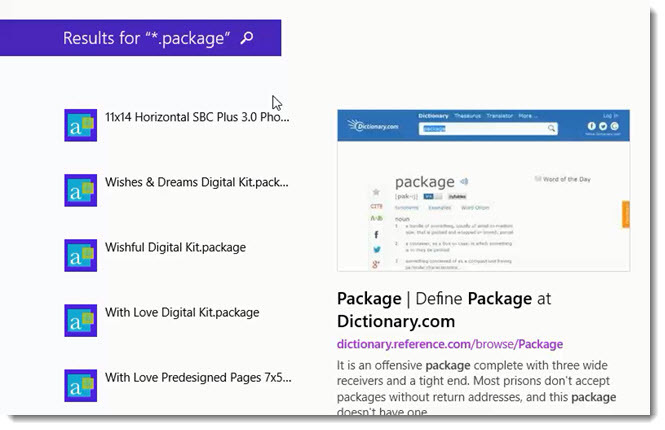 In the Search box, you will type *.package and click Search. This will tell it to find every file on your computer that ends in .package, no matter where it is. When it's done searching, you'll have a list of all of the files it found. This is what the search results look like in Windows 8.1. 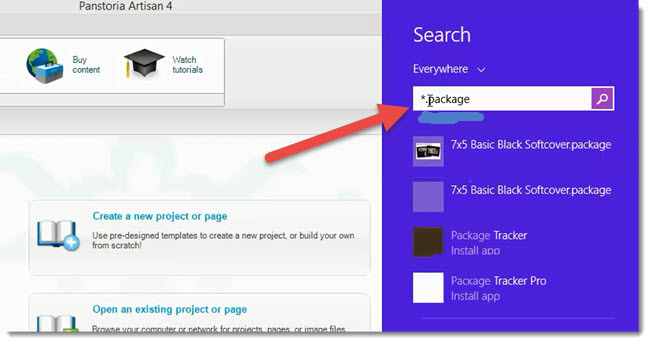 If you hover over one of the packages, you'll see the location of the file on your computer. Make a note of that. 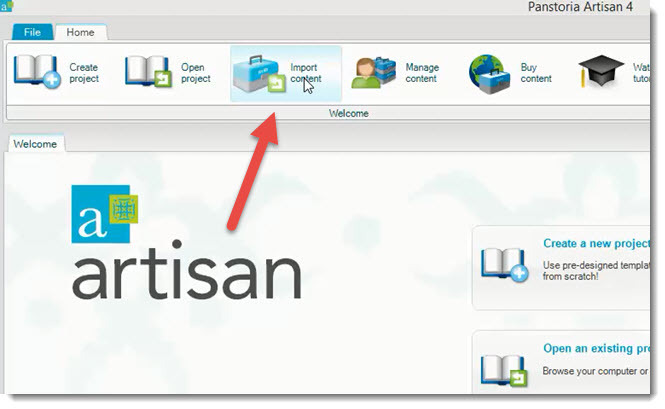 Now, open Artisan and click on Import Content. 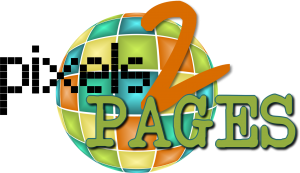 You'll now want to browse out to the location you just made note of to select the package you found and import it into the software. After this, you'll find the content in that Public Documents folder going forward. And you may need to enter an activation key to make it work. But this should do the trick. 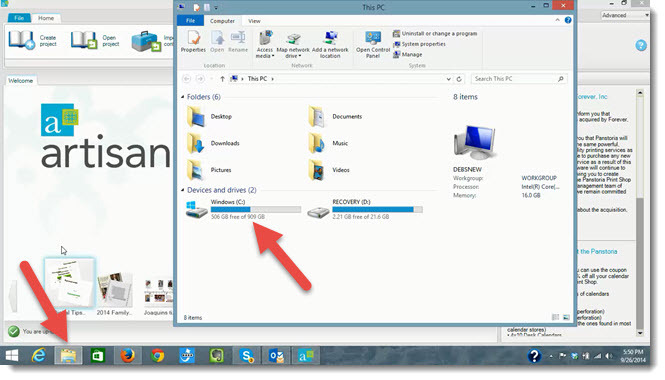 If your missing content is on a backup drive or a portable drive, you would still find it and import it the same way. Just make sure the drive is connected before you do your search and import. Most of the content I have uses the .package extension, but you should also look for .sbkit and now .pakit. I hope that helps. If you have any questions, I'm always happy to help.